Tonight, Stephen Strasburg returned from Tommy John surgery to make his season debut for the Nationals. 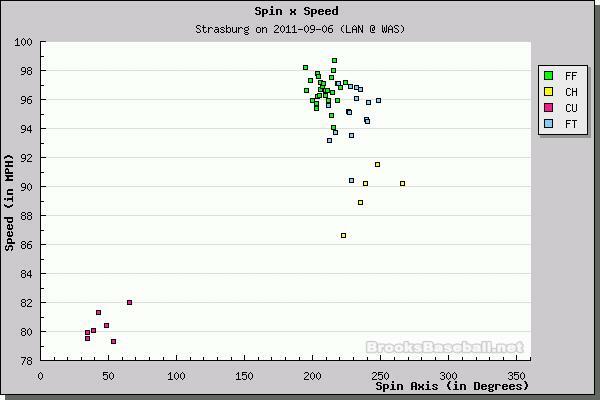 Here is a look at his Pitch FX speeds from tonight compared to one of his starts from last season. It can be seen that his average fastball speeds are about 1 MPH slower tonight than last year. The change is nothing to worry about, especially for a pitcher that has a fastball that averages 97 MPH. Note: It can also be seen that his fastballs are not drop as much as they did last season. The difference in the changeup is due to a different spin axis on the ball has seen from these two graphs. From the few cut-ins I saw of the game, there was no mention of a new changeup grip. It has a new spin and break compared to the one he threw last season. 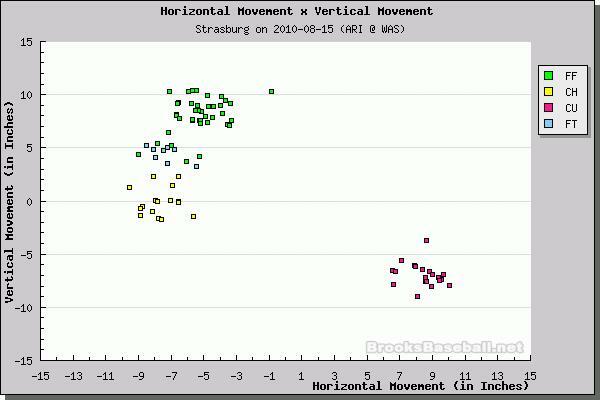 Strasburg is throwing a bit slower this season than last. Also, he looks to have added a changeup that breaks down less. As a whole, he seems back in form and the results tonight seemed to speak for themselves. 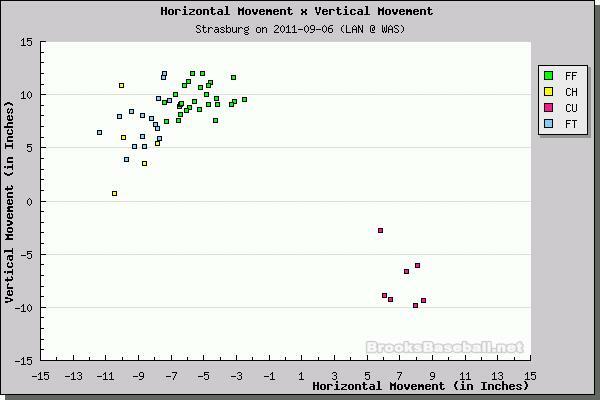 We hoped you liked reading Stephen Strasburg Returns: A Pitch FX Review by Jeff Zimmerman! I saw the game. Good job Ted Lilly for striking out 9. I didn’t get MLB network at all. They kept going to the rain delay in philly instead of showing the nats game. Is it too hard to put some small wording on the screen that says the other game is in delay? Yeah, what was up with that. I didn’t even know 9K’s in 5IP was possible for Mr. Lilly. After the first inning, Lilly had three K’s and Strasburg had 0. You mean somebody played, even PITCHED, in this game other than Strasburg? I never would have known. I was at the game and Lilly didn’t look great in spite of the 9 strikeouts. He was getting behind in the count and had a high pitch count. He did work a long at bat against Strasburg before grounding out which is better than his teammates seemed to do at the plate. Did you see how awful his first swing was? I laughed out loud, then noticed his 0.083 BA.